DCV Aegir was christened in the fourth quarter of 2013. Image courtesy of Heerema Marine Contractors (HMC). An artistic impression of the Aegir DCV designed based on the Ulstein SOC 5000. Image courtesy of Heerema. Aegir will serve Inpex's Ichthys LNG Project offshore of Australia. Image courtesy of Inpex. Aegir is a state-of-the-art monohull deepwater construction vessel (DCV). It is capable of executing complex deepwater infrastructure and pipeline projects in ultra deepwater environments and installing fixed platforms in shallow water. It is the first vessel to use a portable reel system, which saves time taken to sail back and forth to shore. The construction contract for the vessel was awarded to Daewoo Shipbuilding and Marine Engineering (DSME) of South Korea in July 2010, by its owner Heerema Marine Contractors (HMC). Construction was completed in March 2013 and the christening was held in September 2013. "The vessel is capable of executing complex deepwater infrastructure and pipeline projects." The contract to design the vessel was awarded to Ulstein Sea of Solutions in 2010. The new vessel was constructed with an investment of around $700m. The pipelay equipments for the vessel were supplied by Huisman. The new DCV left the DSME yard in Okpo for Huisman yard at Schiedam in January 2013 for pipe-lay equipment to be installed. The vessel arrived at Rotterdam’s Caland Canal for final outfitting fn the lay system in March 2013. The vessel, when fully operational, will serve Inpex in transportation and installation of flow lines, production flow lines, integrated pipeline structures, large subsea structures, a subsea riser support structure and moorings for future FPSO and CPF facilities at its Ichthys LNG Project. The subsea installation contract was awarded by McDermott of Australia to HMC in January 2012. Its first project is to install risers at a depth of 2,000m in the Lucius Field in the Gulf of Mexico, for Anadarko Petroleum Corporation. Aegir won the 2013 KVNR Shipping Award at Maritime Awards Gala held in October 2013 by KVNR, the Royal Association of Netherlands Shipowners. The self-propelled vessel is a customised version of the Ulstein SOC 5000 vessel design and features a class three dynamic positioning system (DP3). The monohull of the vessel has been specially designed to provide a high transit speed. Aegir DCV has an overall length of 210m, width of 46.2m, moulded depth of 16.1m and operational draft of nine to 11m. The transit draft of the vessel is eight metres and the length between perpendiculars is 197.6m. Aegir is capable of accommodating 289 people in single and double cabins, with a maximum capacity for 305 people. The vessel has onboard life saving facilities for 399 people. It is also equipped with two remotely operated vehicle (ROV) work class systems and two launch and recovery systems (LARS) incorporated into the ROV hangars. Aegir is equipped with a pipelay tower for a single J-lay and two R-lay, with a lifting capacity of 2,000t and 4,000t respectively. The abandonment and recovery system (A&R) has a capacity of 2,000t. The maximum pipe payload is 4,500t. "The Aegir DCV was christened in the fourth quarter of 2013." The main crane of the vessel is a revolving mast type crane, with a boom length of 125m, lifting height of 96m above the main deck and a maximum outreach of 79m. The main hoist has a lifting capacity of 4,000t at an outreach of 17m to 40m and 1,500t at an outreach of 78m. The auxiliary hoist has a lifting capacity of 750t at an outreach of 23m to 92m and the whip hoist has a lifting capacity of 110t, at an outreach of 31m to 123m. The vessel is also equipped with two auxiliary knuckle boom deck cranes supplied by Bergen Group Dreggen. The auxiliary cranes have a lifting capacity of 40t at an outreach of 20m and 5t at an outreach of 40m. The main propulsion for the vessel comprises two azimuth underwater demountable thrusters with a rated capacity of 6.5MW each. 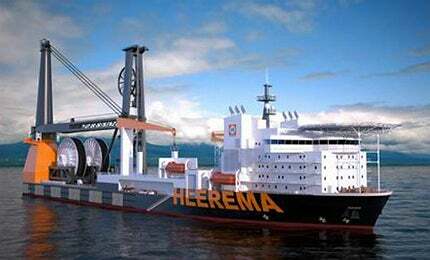 The vessel is equipped with four azimuth thrusters with a rated capacity of 3.2MW each. The tunnel thruster of the vessel has a rated capacity of 2.5MW. The propulsion system of the vessel includes six diesel generators with a rated capacity of 8MW each and an emergency diesel generator with a rated capacity of 1.6MW. Aegir’s propulsion system enables it to sail at a transit speed of 12kt to 14kt. The Global 1200 is the first of two next-generation deepwater derrick pipelay vessels owned by Global Industries, which is an indirect, wholly owned subsidiary of Technip. Skandi Aker is an advanced multipurpose vessel. Delivered in January 2010, it is said to be the largest mono-hull well intervention vessel ever built.